Flowering Pear trees are popular in the Hudson Valley. Prolific white blooms fill this ornamental pear tree which almost looks like the tree is covered in snow. When flowering ends the white petals drift off of the tree through the air like a late spring snowfall. 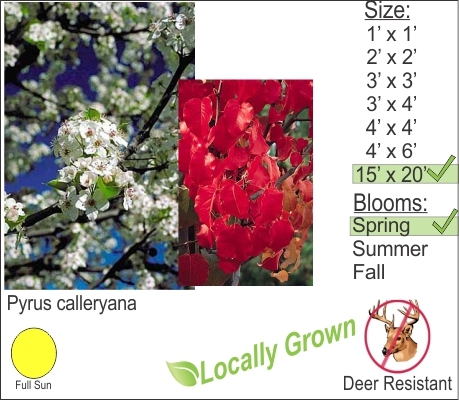 Flowering pear also has a brilliant Autumn color showing of blazing reds and oranges. For larger mature trees 10-15 years plus, consult with your arborist to maintain the branch integrity and structure of mature trees.